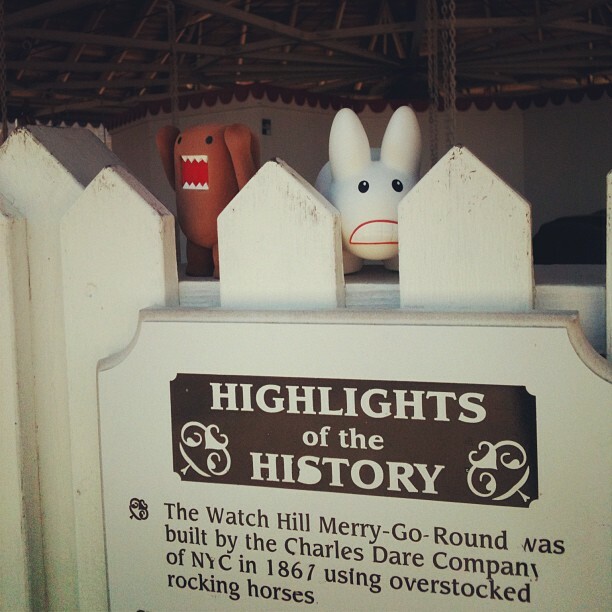 Year of the Labbit: Where Have All The Horsies Gone? Pipkin and Domo made their way from Providence down to Westerly, RI, on the coast of the Block Island Sound. They had heard rumors of an olde tyme horsie carousel, the kind where horses are suspended from above and fly around instead of going up and down from the floor. They heard how rides were only $1 or $2. They heard that you could try and reach out to catch a brass ring and if you caught it you could get a free ride. 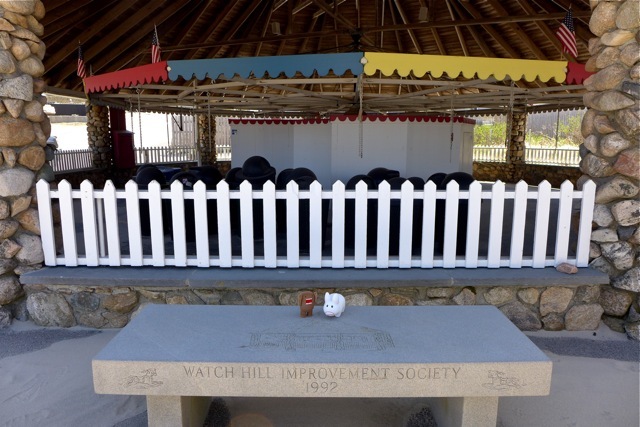 They heard that the Watch Hill Carousel was the oldest and possibly the only operating flying horse carousel in America. They had some pretty high expectations. So they spent a beautiful morning making their way down to the coast, smelling the salty Atlantic air and soaking in the sunshine. When they arrived in Westerly, it looked like a ghost town. All the beautiful mansions were empty (except a groundskeeper here and there), all the shops were closed and empty, and none of the restaurants (by this time it was around noon) had any good smells wafting out onto the street. They nearly walked right by the carousel, it was that quiet. It also didn't have any horses. Instead, the chains hung down and swayed in the light breeze. Garbage cans stood underneath where the horses should have been. Clearly, it is the off season, and nothing is open right now. Pipkin's pretty upset that there will be no horsie rides today. Domo...well. Domo is more than a little vexed. Sorry guys. Looks like you'll have to come back some other time.